If you are currently in the market for a new three-row SUV, it might be time to consider the popular Ford Explorer before looking anywhere else. The Ford Explorer is going to help increase safety on the highway when you activate the adaptive cruise control. Once you select the desired speed, the cruise feature scans the roads ahead for any vehicle moving slower than your speed. If something is detected, the brakes slow down the vehicle automatically until clear, when the speed resumes again. 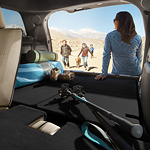 The Ford Explorer also have the enhanced active park assist feature too. The feature scans the road for an available parking spot, then maneuvers into position without driver assistance. All you need to do is control the brake and accelerator, then shift if needed, the vehicle will park the vehicle hands-free without any incidents. Visit Honolulu Ford to take the all-new Ford Explorer for a test drive.